Browse: Home /	Community Gardens, Composting, URBAN FARM & GARDEN, ZERO WASTE / Project LeafDrop 2011: compost your fall leaves locally! Fall has arrived, and we want your leaves! For our compost! In 2008, due to budget cuts, the NYC Department of Sanitation discontinued its program to collect fall leaves for composting, instead taking them to landfills as garbage. A group of community gardeners felt that this was both an outrage and an opportunity, as anyone who composts knows that leaves are a valuable resource and shouldn’t be wasted! Residential leaves represent both a major addition (20,000 TONS) to the city’s waste management burden and a missed opportunity to create free, high-quality gardening fertilizer for NYC residents and community gardens. In 2009 a citywide coalition called NYC Leaves was formed to keep fall leaves out of the waste stream by composting them at local community gardens through a program called Project LeafDrop. Locations to “recycle” leaves can be found all over the city. So don’t put your leaves on the curb where they’ll become trash; bring them to the nearest Project LeafDrop site, where the gardeners will thank you for your gift! Sustainable Flatbush joined the NYC Leaves coalition in 2009, and since then we’ve diverted many tons of leaves from the landfill. 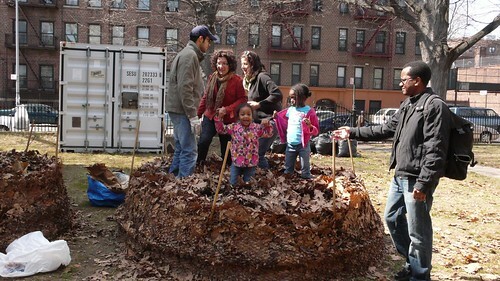 Join us for Project LeafDrop 2011 at our new community garden project, the Church Avenue Communal Garden, located at the historic Flatbush Reformed Church! Our Community Composting program at the garden is growing, so we need your leaves! We’ll accept leaves brought by neighbors and collect leaves from the church property, run as many as possible through a shredder, and store these carbon-rich “browns” for our winter compost collections. We welcome volunteers for this project! Project LeafDrop is a great opportunity to get your hands dirty at the garden and learn more about compost, gardening, and urban soil remediation. If you’d like to volunteer, contact us at volunteer@sustainableflatbush.org or 718-208-0575.